Common Swifts have a clearly defined collective nesting territory. The owners of this territory are the members of the colony. The territory is separated into an inner circle and an outer fringe. Foreign Swifts seldom fly into the inner circle, whereas the outer fringe is an area which is regularly mixed with members of the neighbouring colony. The colony members claim their territory with regular fly-overs and collective screaming. The colony area avoids intraspecific aggression and limits disturbances during breeding. Its borders are stable from year to year and get handed down to successive generations. With regard to the spatial behaviour of the Common Swift, we have some knowledge of their nesting and feeding habits. Cramp (1994) states (after Lack 1956) that the „nest-territory [is] confined to immediate surroundings of nest; serves for part of courtship, some copulation, and the raising of young”. Most observations relate to their feeding grounds which are either near (Parmenter & Owen 1954, Brinkmann 1931 in Weitnauer & Scherner (1994) or separate from their nesting sites (Cramp 1994, Gory & Jeantet 1986, Gladwin & Nau 1964, Koskimies 1961, Cutcliffe 1955, Haartman 1949). Others have noticed the gatherings over inshore waters under bad weather conditions (e.g. Lack & Owen 1955, Ries, in Stadler 1917, Birk 1916, Dornig 1916) or in hunting fields on migration (Trouche 1948). But the reports remain unclear as to the location of the territory of the colony, in particular the organisation of periodical relationship of Swifts during their stay in our part of the world. Cramp (1994) merely mentions a „colony area”, in which the flock races around and calls. Kaiser (1992) notes that some non-breeders „return each spring to their individual territories“, Busche (1995) states that swarms of different origin circled around specific places, and Gory 1994 mentions that his analysis of nesting materials show them to have been „collected within a one kilometre radius of the colony“. Offringa (1994) uses the term colony in a vague sense („vanzelfsprekend“) while Tombal & Tombal (1995) consider it as a spacial grouping of Swifts, seperated from each other, around a building, a street, a city or a quarter and Colombo & Galeotti (1993) mention that „air-ranges of different colonies showed no overlap and stranger individuals were driven off“. There is, however, a lack of detailed information on the spatial behaviour of the Common Swift. 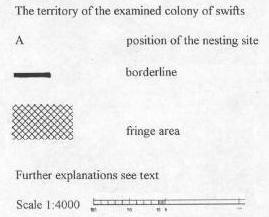 In 1993 I first recognized of the concept of a territory for Swifts (Tigges 1994). Instead of term “territory” I then used the neutral word Kiez (quarter). At that time I was not quite clear about the sense and marking of a territory which by international consensus requires defence behaviour (e.g. Lawrence 1995, Hentschel & Wagner 1990, Berndt & Winkel 1983, Dathe 1978). But in fact the colony area of Swifts is a territory in its full meaning. It is a clearly defined space which is regularly flown over by the members of the colony and which is differentiated to foreigners of the same species through calls. The investigated colony of Swifts is located in the centre of Berlin at co-ordinates 52°29’N 13°26’E. Although this is a built-up area the surface is not completely covered by concrete and roads: there are two small green spaces as well as numerous backyards covered with bushes and trees; there are two playgrounds with surfaces of sand and stone chippings; in all the streets there are rows of trees, mostly adult limes; there is also a big car park, a school yard and a large number of garages. The houses are mostly old buildings in good condition, which are divided into four flats. About half a mile to the west is a municipal park of about 50 hectares, which adjoins Tempelhof airport. Within the park there is a newly built pond of about 3,200 square metres of water surface, but this pond is rarely used by the Swifts for feeding or drinking. The following observations arose from the settlement of one pair of Swifts in a nesting box placed in a window of my 4th floor flat (see position A on the map). 13 other Swifts gathered around this breeding pair, making a colony of 15 Swifts. I was able to observe the flying activities of this colony very intensively for 5 years. From 1991 until 1993 this pair was the only breeding pair. Since 1994 there has probably been another pair (position B on the map). What was remarkable was the high proportion of non-breeders. In a neighbouring colony again just one pair bred in 1993 (Tigges 1994). This small group was easy to observe and identify, a lucky requirement which would hardly be possible with higher numbers of individuals. This colony of Swifts possessed a fixed territory of about 120.000 square metres (ca. 30 acres). It consisted of a centre which was flown over by the members nearly exclusively and a fringe which was used by members of the adjacent colonies, too. This fringe extended over open space such as a parking place and a school yard. The birds orientated themselves according to the local topography and set the borderline as a line of houses, so that in this case the territory had the form of a triangle with the sides of length about 420 x 430 x 520 m .
Under good weather conditions the territory was left around noon. The birds flew away between 11 am and 2 pm and got back in the evening between 5 and 8 pm (CEST). The birds might go off for feeding flights. Haartman (1949), Hess (1926) and Swaen (1922) report the same behaviour. The observation that the birds reappeared a good half an hour before sunset can be a hint of regional differences in behaviour (Busche 1995). After their arrival in the first two weeks of May, the breeding pair occupied the old nest site. In 1993 the pair in my home was the only breeding pair in the colony. Other birds, who arrived at around the same time called on potential nesting sites and occupied them or over-summered as non-breeders within or outside the territory. According to my observations what was presumed to be yearlings (birds hatched the previous summer) appeared in the second half of June. Their arrival was apparent in that the stock of birds rose from about 7-8 to 14-15 individuals and that the hunt for nesting places began once again. The arrival of the yearlings has not yet been systematically studied. My own observations correspond with those of Kaiser (1992). On the strength of ring controls he states that the yearlings arrived in his colony in Hesse in the second half of the month of June. However, Weitnauer (1990) states that their arrival in his Swiss colony coincided with that of the breeding adults. The yearlings adapt to the new colony of their own choice relatively fast (Kaiser 1992). Until now it has been unknown whether or not they move forward like the breeding adults in geographically orientated waves (c.f. Sliwinski 1938). The search for nesting sites by newcommers principally takes place in their own territory. Tests with acoustic signals showed that only that part of population which belongs to the colony respond to the vocalizations of the prospecting birds. All the other Swifts showed no reaction and moved towards the centre of their own colonies. In this experiment duet calls recorded at a nesting site were taped to impersonate an occupied nesting place. However, not all Swifts who could reacted to these calls from their own species. The place of this experiment was only some metres away from the borderline of the centre (cf. C on map) so that I was able to watch those individuals of the neighbouring colony too, who used the outer part of the territory, too. These birds did not show any reaction to the acoustic signals and were exclusively oriented to their own territory (Tigges 1995). As of the second half of July, towards the end of the Swifts’ stay with us, the frontiers lost their significance. The young were either fledged or were just about to fledge. It was now possible to observe more frequently than before that some members of the colony left their territory for a short time to fly together with their neighbours in the neighbouring territory, or conversely members of neighbouring societies entered their territory for flying together. In spite of the increased frequency of this mixing, the boundaries were still in force which was evident both in the short time of gathering (during periods from only a few seconds to a few minutes) and the respect for the area for the rest of the time. The size of these amalgamated flying groups ranged from between about 15 to 50 individual birds. During this period there was a clear rise in the frequency of visits to the nesting sites and the number of individual birds appeared to be greater than during the rest of the stay. In this case, it was not part of the regular search for suitable nesting places but rather appeared to be a highly ritualised conduct for social purposes. This behaviour seems to strengthen the sense of the common bond on the one hand and show the locality to the potential future colony members. Amongst these potential future colony members were probably both members of neighbouring colonies as well as chicks (the current year’s fledglings). Kaiser (1992) reported from his colony at the southern ridge of the Taunus mountain that 40 % of the adult non-breeders return year after year to the colony. Applying this same percentage to the local conditions leads one to the expectation of about eight or nine newcomers every year, if the size of the colony is calculated with 15 birds (from them two breeders and six adult non-breeders in 1993, four breeders and four adult non-breeders in 1994 and 1995, and each time seven yearlings). The advantage of maintaining a territory is to reduce intraspecific aggression. The discovery of a suitable nesting site undoubtedly is the most important event in the life of a Swift. After its return from Africa, the adult bird occupies at once or after a few days its traditional nesting site (Lack 1958). Mature individuals who do not yet have a nesting site begin with seeking nesting sites and try out especially those places which they know from previous years, which generally means those sites already occupied. This gives rise to the owners claiming their right of the hole or nesting site, which they defend vigorously. Aggression in Swifts is high. If fighting breaks out, it is often vicious and, due to the method of fighting, including the use of claws, this often leads to severe injuries or even to the death of one of the adversaries (e.g. Kaiser 1992, Reuter et al. 1980, Roper 1960, Lack, 1956, Damm 1934, Brehms Tierleben 1927, Lakowitz 1925). The explanation for the toughness and stubbornness of fighting Swifts (c.f. Lack & Lack 1952) lies in the breeding biology. Suitable holes, which are necessary for reproduction, are only found in limited numbers in nature. A similar situation arises once again after the arrival of the yearlings. The fidelity to the breeding place is not yet effective and their dispersion dynamic is relatively high. On their common flights with the colony members they learn the territory borders, thereby establishing their traditional area. It is only then within this area that the search for a suitable nesting site occurs, thereby avoiding any intraspecific fighting with birds from other areas, and limiting the associated disturbance and stress. In the five years of observations I could not quote any change in the behaviour of the colony, so that one can assume that under same exterior conditions a colony of Swifts is a stable unit as far as the numbers of individuals as well as the territory borders are concerned. On the basis of this new discovery one can answer the question raised by the “screaming displays” (Cramp 1994) or “flying screaming parties” (Hayman 1990, Lack & Lack 1952). They declare the claim of ownership of the colony territory. There may well, of course, be further meanings in these actions. I am grateful to Henry Hahnke, Museum of Natural History, Berlin for the discussions and Marc Wentworth, London for the revision of the English text. 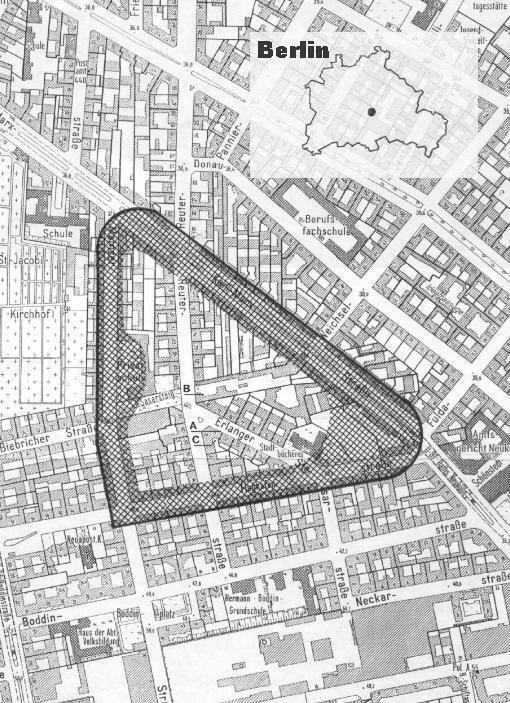 Brinkmann (1931) in Weitnauer, Emil & Scherner, Erwin R. 1994: Apus apus - Mauersegler. Dornig, Heinrich (1916): Der wahrscheinliche Ursprung der Benennung Regenschwalbe.